In the meantime, I have outstanding rally targets at 2924.50 and 3005.63 for this vehicle, which settled on Friday at 2807, down 55 points. Although it’s possible that last Thursday’s top at the 2866 target was the start of The Big One, a glance at the chart reveals that the day’s heavy losses were small when viewed against the steep, relentless rally begun in the final days of 2018. 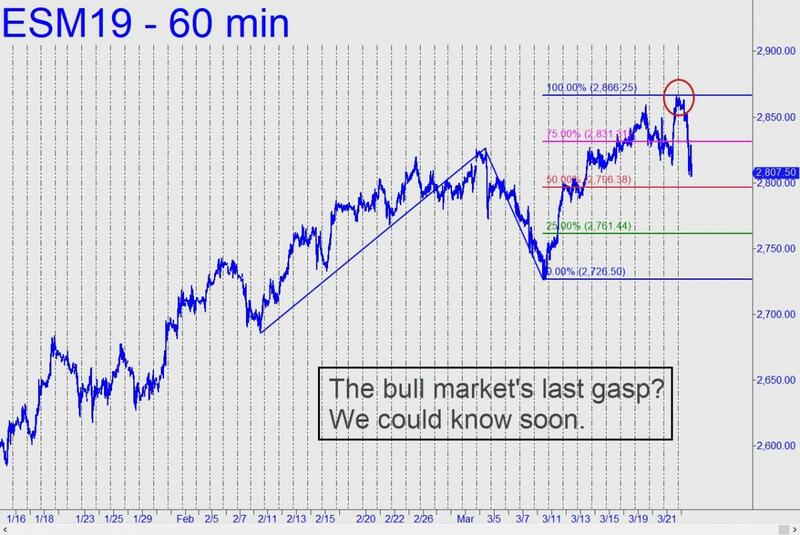 We will treat last week’s top with respect and caution in any event, but we should remain alert to the possibility of one more upthrust that would set up bulls and bears for the haymaker. If you don’t subscribe, click here for a free two-week trial that will give you access to everything. And please do stop by the Trading Room to say hello.